← Who wants to be Mayor? Picnic update: David + Dave! So four weeks ago I wrote a blog post about my birthday picnic, scheduled for October 5th, 2pm, at Trinity Bellwoods Park. 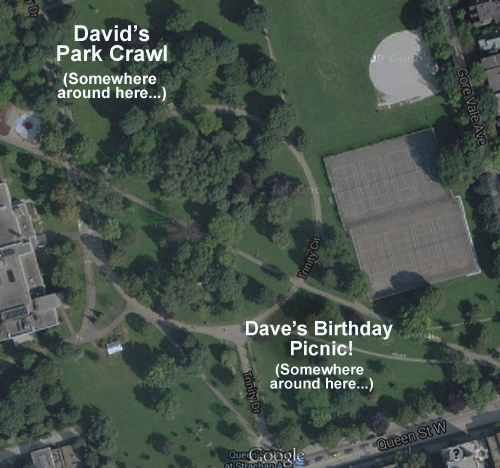 Since then, I’ve learned that some other guy named David is ALSO having a party on October 5th, at 2pm, in Trinity Bellwoods Park! It seems that the Logistics Team at the International Davids Schedule Coordination Centre was asleep at the wheel. Luckily, it looks like it’s gonna work out fine! Perfect! You can join the Park Crawl, meandering along the route of the buried Garrison Creek, and then join us at the Birthday Picnic at 2pm! I’m actually a huge fan of Suzuki, and excited to be sharing the park with his crew on Sunday. Some of my earliest jobs in the non-profit sector were with the David Suzuki Foundation, doing promotion and volunteer coordination for the Salmon Forest tour (2001), Human Element Tour (2002) and his tour with Stephen Lewis in 2007. The Foundation was also a partner in the Smog Hike that I orgninised for TEA in 2007. And of course I’ve already bought my tickets to Friday evening’s Blue Dot tour! On Sunday, David will be giving a speech in Trinity Bellwoods at 4:30. A great way to end a great picnic! Suzuki will be in the west end of the park, near the playground. I’ll be near the south end. This entry was posted in I Have Too Much Time on my Hands, The City is Beautiful. Bookmark the permalink.